For those of you who missed Metrodome's UK DVD release of the 2006 documentary Going to Pieces: The Rise and Fall of the Slasher Film, newcomer specialist horror distributor 88 Films have announced the upcoming DVD release of Slice and Dice: The Slasher Film Forever, which is waving the sunbtitle "The Complete History of Mad Maniac Movies". Complete? We shall see. With reliable Arrow horror regular Callum Waddell in the director's chair, we can at least get our hopes up. The winner of the best documentary award at the annual South African Horror Film Festival, which was also given a competitive late night slot for its première at the prestigious Sitges Film Festival, Slice and Dice: The Slasher Film Forever has landed a number of accolades and was labelled "Essential viewing" by the good people at Twitch Film. Filleting-up numerous facts, which will appeal to both the seasoned follower of shock-cinema, and the more passive fan of fear-films, and featuring interviews with Corey Feldman (Friday the 13th: The Final Chapter), Tobe Hooper (The Texas Chain Saw Massacre), Mick Garris (Masters of Horror), Tom Holland (Child's Play), Jeffrey Reddick (creator: Final Destination), Adam Green (Hatchet) and Scott Spiegel (producer: Hostel series) to name but a few, this is a documentary which aptly investigates the appeal of the ever-endurable stalk and slash trend. 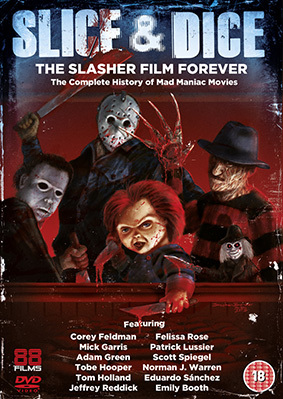 Slice and Dice: The Slasher Film Forever explores all of the genre's most famous features – including Psycho, The Texas Chain Saw Massacre, Halloween and Friday the 13th – as well as various cult obscurities and long forgotten flops. Slice and Dice: The Slasher Film Forever lands on UK DVD as a splatter-packed 2-disc set on 13th May 2013 by 88 Films at the RRP of £17.99. Full Moon trailer park including trailers for slasher greats Tourist Trap, Puppet Master and Intruder.